From 2,000 feet above the city of Dawson Creek, snow-dusted Peace Country shows off its riches in the afternoon sun. The rolling landscape is a patchwork of fields and forests, criss-crossed with finished and unfinished pipelines. Scattered in all directions: huge natural gas processing and compression plants, oil and gas wells large and small, and drilling rigs, many sitting on farmland. Our 1963 Cessna, flown by private pilot Garth Walter, floats over hillsides cleared of trees, their trunks stacked like toothpicks. Before returning to town, we survey groundwork for the controversial Site C hydro dam on the banks of the Peace River. My host and constant companion for this two-day March visit to northeast B.C. is Dawson Creek’s gregarious mayor, Dale Bumstead. 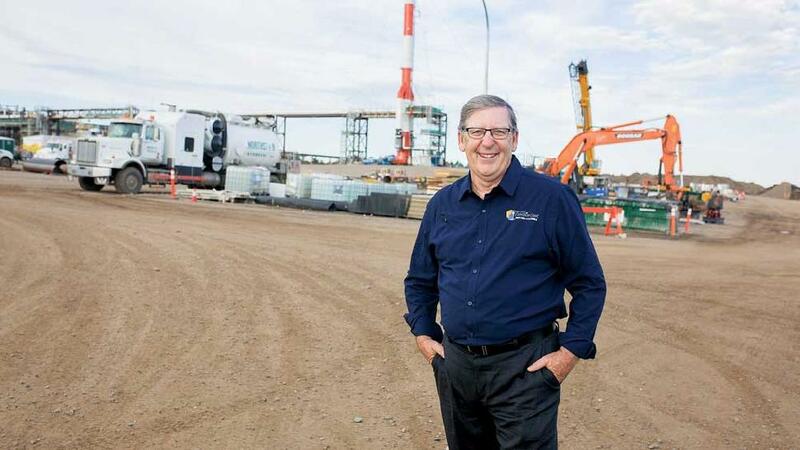 The province’s long-awaited liquefied natural gas industry may be stalled, but as Bumstead notes, that isn’t stopping Encana Corp. and other players from spending billions on exploration, processing and pipelines in the Peace. Extraction costs are low, and they want to be ready to supply LNG plants on the coast. Also, the local Montney shale formation’s prolific oil and gas reserves yield bonus liquids such as propane and butane. “The Montney is that big a reserve that it could produce eight to 10 billion cubic feet of gas [daily] for 100 years,” Bumstead says. All of this activity is bringing thousands of well-paid workers to Dawson Creek, a community of about 13,000. 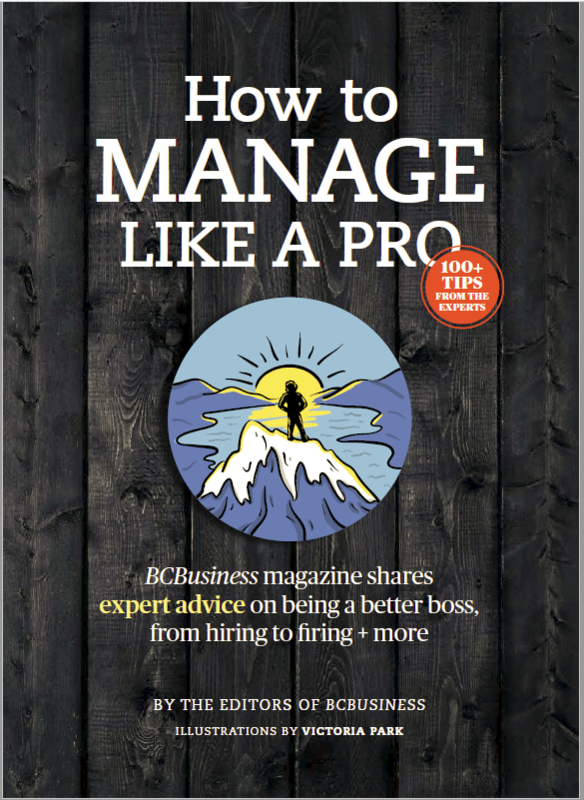 For the ever-smiling Mayor Bumstead, a third-generation resident and a retired Insurance Corp. of British Columbia executive, accommodating the influx is a good problem to have following a rough couple of years for the energy business. The Peace sometimes feels more Alberta than B.C., partly thanks to its prairie terrain and farming. Dawson Creek is the service hub for a thriving agriculture industry that specializes in crops like wheat, canola and field peas. Grain elevators stand next to the railway tracks running alongside main drag Alaska Avenue, home to many of the city’s 920-odd hotel rooms. On one drive, Bumstead points out RVs inhabited by energy workers, even with temperatures still dipping to –15 C at night. “Our hotel rooms are full, the restaurants are full, rental accommodations are full,” he says. Bumstead’s grandfather moved to the Peace from Saskatchewan in the early 1940s to homestead. An entrepreneur, he bought a sawmill in Fort Nelson. One day in October 1958, he was brushing the snow off the machinery when his hand slipped and turned on the planer. “His mitt gets caught in the planer and pulls his arm in and cuts his arm off to his elbow,” Bumstead says. 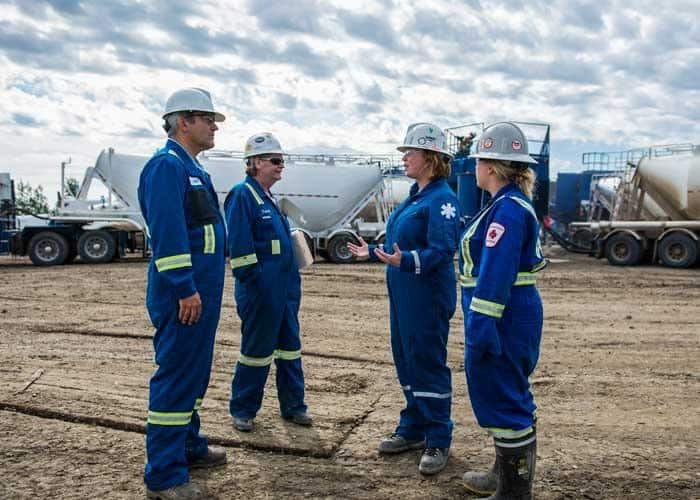 There’s a much stronger emphasis on safety when we visit the local office of ARC Resources Ltd., a Calgary-based oil and gas producer that employs 90 people in Dawson Creek. Ron Toly, ARC’s manager of field operations for northeast B.C., explains that operating costs in the Montney are much lower than elsewhere. For example, it costs ARC about $3.6 million to establish a gas well there, versus $9.2 for producers in the Appalachian region of the U.S. “It’s the liquids driving the bus, and the low operating costs,” says Toly, who wears a hoodie and ball cap. Donning fire-retardant red jumpsuits, steel-toe boots and other safety gear, Mayor Bumstead and I jump into Toly’s pickup and head out to an ARC oil drilling rig. In a portable across from the rig, a towering structure dangling 4,000 metres of segmented drill pipe, a computer screen shows a 3-D map of the well. Warren Schnedar, drilling superintendent, operations, outlines the process: drill straight down through the Montney shale, then open a horizontal hole as long as 2,500 metres. Once the pipe comes out, “the whole thing will be cemented on the outside all the way to the surface” before completion, Schnedar says. Next stop: an ARC completion site where hydraulic fracturing, or fracking, for oil is underway, with help from 14 roaring 2,200-horsepower pumps housed in tractor trailers. “We’re opening the formation up—by millimetres, of course—and then we’re putting sand and water in there, so that when the formation closes on itself again, it can’t seal off,” says completion superintendent Sam Tschetter. A tireless promoter of the oil and gas industry—both of his sons work in the business as power engineers—Bumstead knows his stuff. 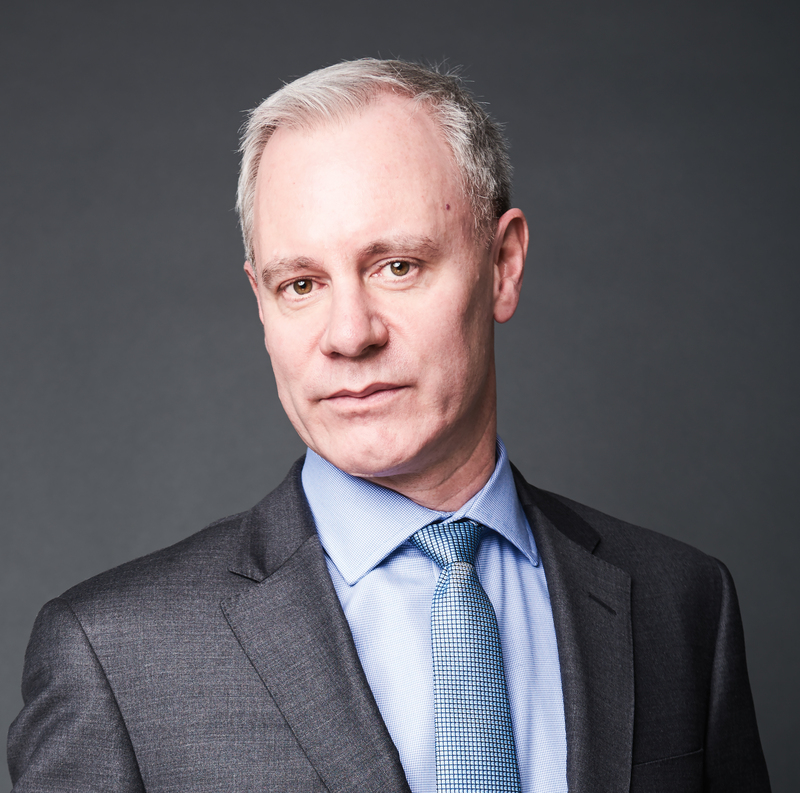 At a lunch held by the Dawson Creek & District Chamber of Commerce, he outshines the guest speaker, a Business Development Bank of Canada expert on the sector, by sharing his encyclopedic knowledge of the Montney and its developers. 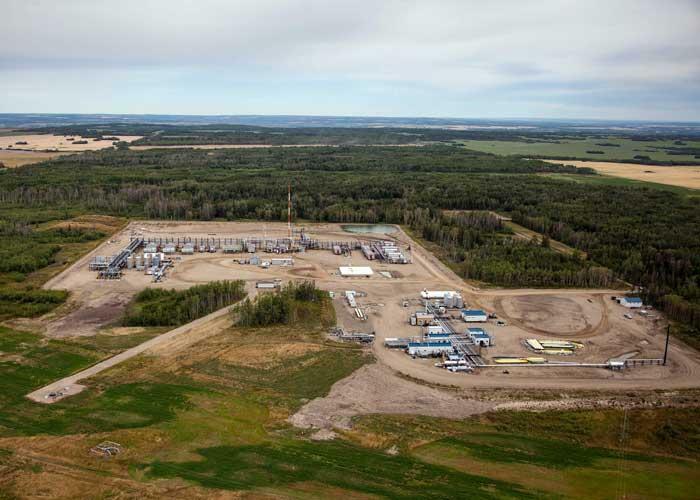 The formation already produces some 4.5 billion cubic feet of natural gas a day, according to the National Energy Board, about one third of the Canadian total. Lieverse shows us Encana’s Water Resource Hub, whose two big tanks contain about 100,000 barrels ready to be used for fracks. One criticism of fracking is that it requires vast quantities of fresh water. The hub gets its supply from three sources, Lieverse says: recycled frack water, salty water brought to the surface with natural gas and water from a shale formation that contains little gas. Pumped to sites by pipeline, this water accounts for as much as 80 per cent of Encana’s total usage, he estimates. On the site of Encana and Veresen Midstream’s Sunrise processing facility (now up and running), a maze of staircase- and ladder-bedecked buildings with a daily capacity of 400 million cubic feet, we meet baby-faced plant lead Randy Munch. Wages have fallen in the past two years, but many industry workers still make $100,000 to $150,000. On a plant startup, some will earn as much as $200,000, says Munch, a native of nearby Chetwynd who joined Encana 15 years ago after getting his power engineering ticket. People with that kind of dough need somewhere to spend it—and something to do in their off hours. Perhaps Dawson Creek’s most surprising feature is the Encana Events Centre, owned and subsidized by the city and operated by a division of U.S. media titan Comcast Corp. The building’s 6,500-capacity arena has hosted everyone from Bob Dylan to B.C. pop sensation Carly Rae Jepsen to country star Jason Aldean—and there’s a room full of autographed guitars to prove it. But the complex also contains a community swimming pool and an equestrian centre, complete with 110 stalls and an indoor corral. It’s part of Dawson Creek’s effort to attract doctors, lawyers and other professionals, observes general manager Ryan MacIvor: “When they come here and see the amenities that the city has for them,” he says, “it really helps them make their decision to move.” In turn, Dawson Creek can draw other new residents because those workers make it a regional centre, MacIvor adds. To see forestry’s contribution to the economy, we visit Louisiana-Pacific Canada Ltd.’s oriented strand board (OSB) plant on Alaska Avenue. The facility employs about 150 people and makes its board from high-quality local aspen. “Most of the OSB industry has a certain level of envy for the wood that we have here,” says environmental manager Shawn Trottier. For him, OSB is environmentally friendlier than conventional lumber because it’s made from species that regrow quickly and uses wood more efficiently. Output from LP’s hot factory floor is staggering: about 30,000 four-by-eight panels a day—using 40 truckloads from the sea of logs outside—for a total of some 350 million square feet in 2016. Roughly 80 per cent of the finished product goes to the U.S.
With that out of the way, Mayor Bumstead smiles.